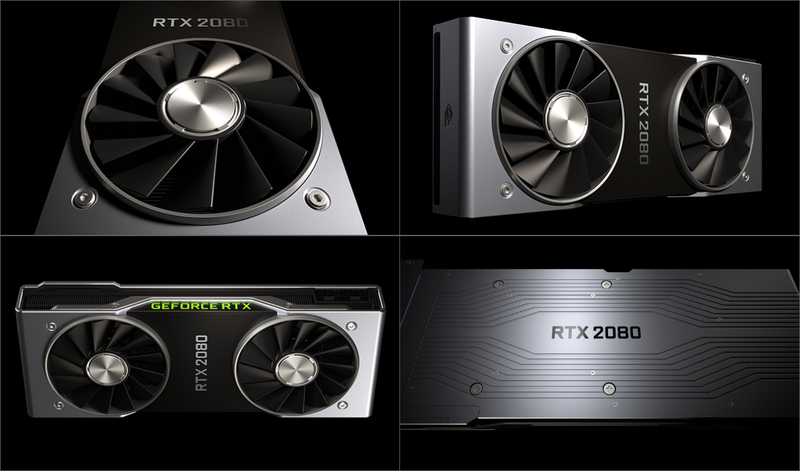 Between releases, in the middle; It took 2 Years, 4 Months for the RTX 2080 to come out after the GTX 1080. Adjusted for inflation, as of January 17th, 2019 the 400A chip can be purchased for $649 in Europe, fifty under the MSRP! Question: What does Non-A mean? Answer: There are two GPU variants: TU104-400-A1 (1E82) and TU104-400A-A1 (1E87). Factory overclocking is prohibited on the former, it has a boost of 1710 MHz and a power limit of 240W. The latter chip has varying factory overclocks and power limits up to 338 W, flashing a 400A based BIOS onto a 400 GPU and vice versa is not possible. Manual overclocking is possible on both. Question: How do I know if I have a 400 or 400A card? Answer: Check the list above, but it may be incorrect as the early batches of the ASUS Turbo card had the A chip, recent reports indicate later batches are the correct 400 chip since the card was always advertised as not having a factory overclock. 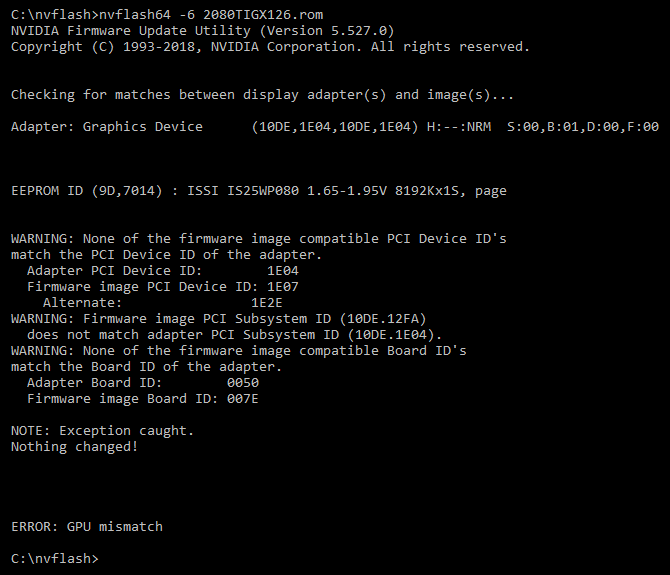 To be certain, check the Device ID in the main window of GPU-Z, if it shows 1E82 it is the 400 chip, if it shows 1E87 it is the binned 400A chip. Question: How do I know what power limit my card has? 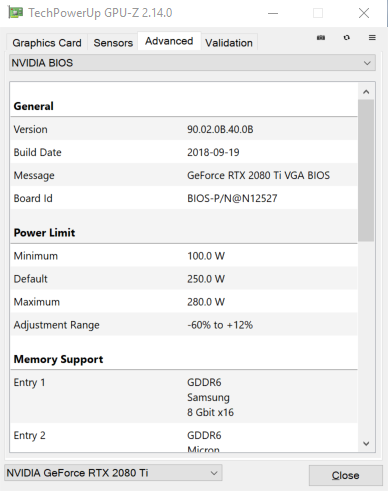 Answer: In GPU-Z, click the Advanced tab, then General and finally choose NVIDIA BIOS, under the Power Limit section you will see Default and Maximum. Last edited by zhrooms; 04-09-2019 at 02:49 PM. Never owned a card from MSI before so i have no idea how their cards are? MSI makes great cards, never had any issue with them and I'm a big fan of their coolers. Just pre-ordered the gaming trio myself. Wanted the strix also but I was too slow. Finally I can upgrade my 980Ti. Maybe i should give them another try as their cards are the cheapest? I'm going to give him the 2080 for $730 and I will get the SSD for a cheaper price. In case my friend decide to not want it anymore can you cancel newegg preorders anytime you want? Yes newegg lets you cancel anytime prior to it actually shipping. A lot of people are crying about preordering without benchmarks but IMO it's pretty safe. Unhappy with the results/leaks later next month, just cancel. Just in case you don't know, the standard XC (non Ultra) is a 2 slot card. The Ultra is a 2.75 slot card that uses their ICX2. I dunno if the $100 increase in price is worth it but going from the 1080 Ti, every 2 slot variant was hot and loud. What software do you need with the FTW cards? I just have the nvidia driver installed and Afterburner for overclocking on my Asus strix 1080.